Russian deputy prime minister Arkady Dvorkovich ordered the Transport Ministry to submit proposals for the possible sale of Aeroflot’s stake in its subsidiary Rossiya Airlines, Vedomosti daily reported, quoting government officials familiar with the issue. Aeroflot holds a 75%-minus-1 share in Rossiya, whereas the blocking stake is owned by the administration of Saint Petersburg. As one of the versions has it, the possible motive behind the suggestion that the flagship carrier should shake off its largest subsidiary, is that the government’s wish to maintain a healthy level of competition on the Russian air transport market. Ministry of Economy has recently sounded concerns that the industry is becoming increasingly dominated by Aeroflot. “We back privatization and competition”, deputy economic minister Yevgeni Yelin said, according to Vedomosti. “We should develop availability of air connection not only from Moscow but from Saint Petersburg as well,” he said. Other versions include the idea of internal cannibalization. Contrary to international practice Aeroflot Group is present in three different customer segments. the title airline positions itself as a premium carrier, its subsidiary Rossiya is an “economy class airline”, and another subsidiary, Pobeda, is a lowcoster. This leads to Rossiya competing against both Aeroflot and Pobeda. A governmental source also told Vedomosti that Aeroflot still hasn’t managed to turn Rossiya around, as it still is making losses. Reportedly, the Transport Ministry also backs Rossiya’s sale. According to the ministry representative, a work group has been created to review Rossiya strategy as well as the issues of regional transportation development. This spring Aeroflot Group completed merger of its three subsidiaries – Rossiya, OrenAir and Donavia – under Rossiya brand. 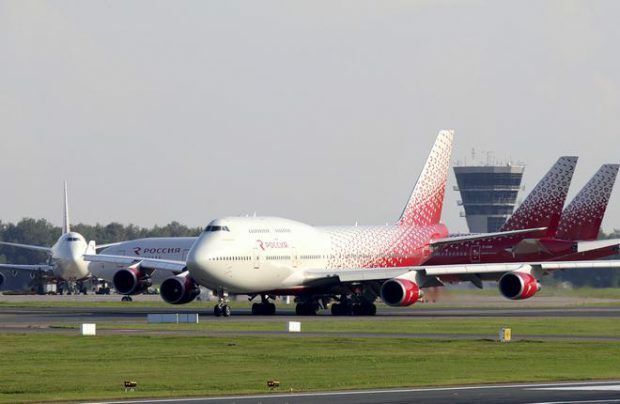 Vitali Saveliev, Aeroflot’s director general predicted that the reformed airline would rank second by traffic among Russian carriers; however Rossiya is only third with 4.7 million passengers in January-August lagging behind S7 Airlines with 5.4 million passengers. Ever since the dawn of the economic downturn Aeroflot has been consistently cutting Rossiya’s route network forcing it to concentrate on flights to Moscow, thus hurting the business of regional airports, St. Petersburg’s Pulkovo above all. The plan is to change the owner of the airline to make it carry more passengers from Saint Petersburg. At the same time the government acknowledges that the terms of sale should be thoroughly weighted and possible bankruptcy risks minimized, as Rossiya has been relying heavily on long-term support of its parent company. “In its current state Rossiya is unlikely to survive on the market, the airline needs serious investments and is far from certain to become a real competitor for Aeroflot,” says Fyodor Borisov, leading research associate of the Transport Economy Institute. According to him, the competition depends on Aeroflot’s good will and there are no painless methods to support it. “However Rossiya’s privatization is better than imposing routes and social tariffs on Aeroflot,” he said. On the other hand, the industry experts doubt the attractiveness of Rossiya as a potential asset for investors. The administration of Saint Petersburg is in fact the only probable buyer of the airline. Alongside that, Aeroflot has claimed that the question of a possible sale of Rossiya is not on the agenda. “Aeroflot group strategy is aimed at creating a national aviation holding with Rossiya being an integral part of it. The strategy has been approved by the government of the Russian Federation,” Interfax newswire reported, quoting an Aeroflot representative.